So far, we’ve covered the basics of surgical stainless steel and titanium as well as built up a little bit of knowledge on gold, glass, and niobium; but there is far more to jewelry than just the correct materials. In this installment, we’re going to get a little more general with what else to look at in body jewelry: the threading and polishing. Do You Want Threading With That? 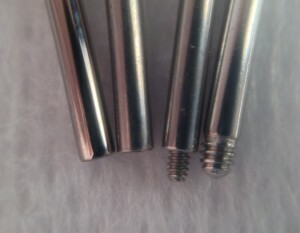 From right to left: Industrial Strength internally threaded barbell, generic internally threaded barbell, "step down" externally threaded barbell, and externally threaded barbell. With most types of body jewelry, you have the post (or bar) and the end or ends (or ball, gem, opal, spike, et cetera), but how do these stay together to make a single piece or jewelry? It depends, because there are multiple ways this can be accomplished: there is threaded body jewelry and threadless, as well as internally threaded and externally threaded; let’s start off with threaded jewelry, externally threaded to be specific. So what is the difference between external and internal threading? 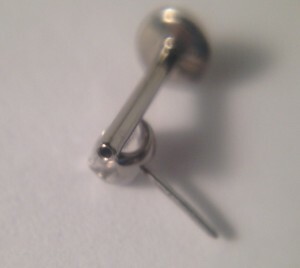 Well, when it comes to externally threaded body jewelry, the barbell (or circular barbell or labret bar) has the threads on the bar, which exposes the sharp threads to your piercing’s fistula (a fancy sounding word for the skin that grows around the inside of your healed piercing, creating the channel for jewelry to pass through). Not only is there the threat of the jewelry cutting a healed piercing, but the threads also offer bacteria a place to hide away and multiply, which is problematic for fresh piercings as well as healed. 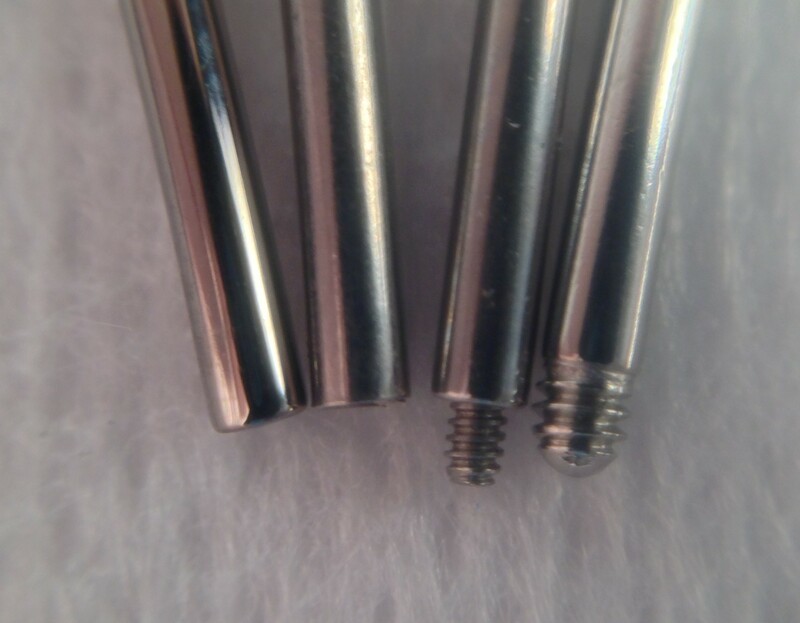 However, there are companies that have stuck with the external design and made it safer by making the threads smaller than the bar so, when used with proper tools, the jewelry can be inserted without your piercing channel coming into contact with the potentially harmful threading. Internally threaded jewelry, however, has the threading on the ends, not on the bar, so they screw into the bar as opposed to onto. 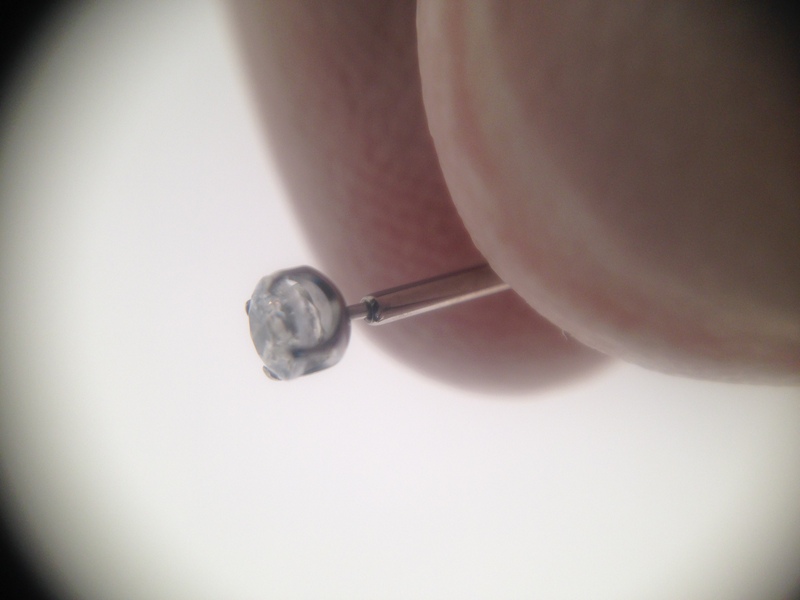 This makes for much safer insertion, as your body isn’t exposed to any threads on the jewelry. 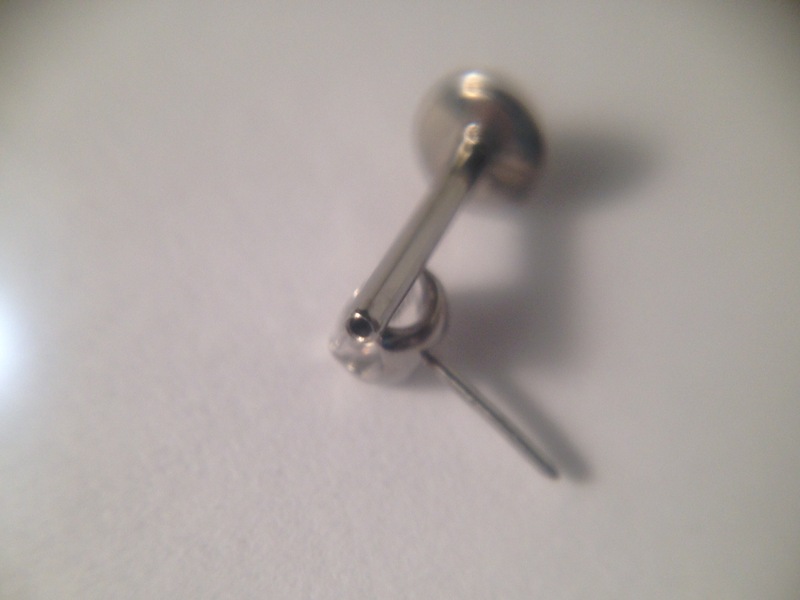 Macro photo of a threadless 16 gauge universal post and 2.5mm prong set gem from Neometal. 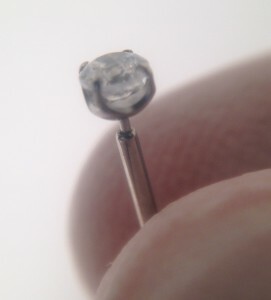 A partially assembled piece of threadless jewelry from Neometal. Then we have threadless body jewelry, which, as the name implies, has no threading; instead, it uses tension to hold the end and post together. 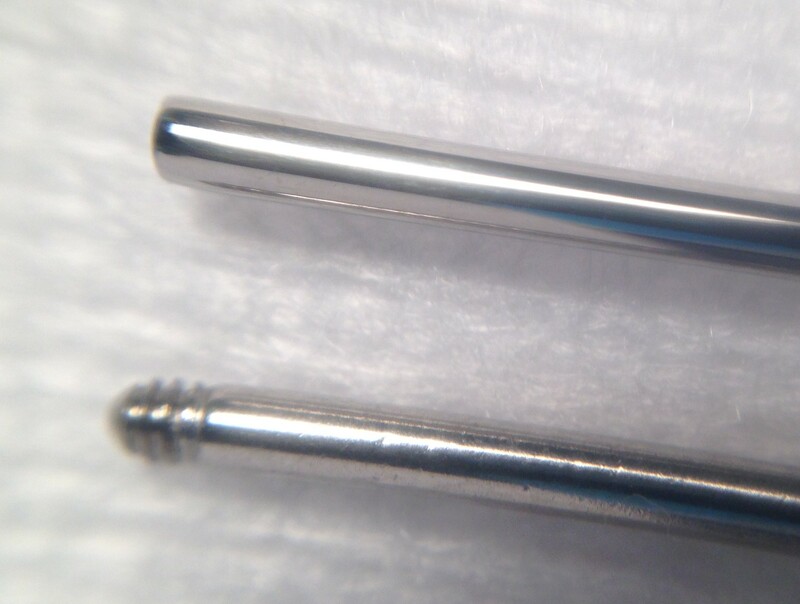 This is achieved by bending a small insertion pin that is attached to the end and inserted into a hollow post not much larger than the insertion pin, which creates the pressure that holds the piece together. Threadless pieces are only available for smaller gauge jewelry (think nostril and ear piercings), so unfortunately this style will not be applicable to all body piercings. Most professional piercers will tend to use internally threaded or threadless jewelry not only in initial piercings but also in healed piercings to minimize possible complications that unfortunately come with external threading. 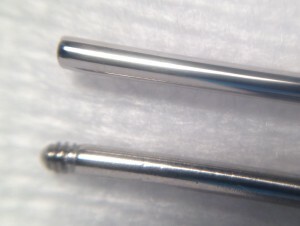 Macro photo of an Industrial Strength internally threaded barbell (top) and an externally threaded barbell (bottom); you can see the uneven surfaces on the externally threaded piece. Another factor that leads piercers into using internally threaded or threadless jewelry is the finish that comes with them; quality companies that produce such jewelry also hand polish their pieces to assure a smooth surface and nice shine. Even the tiniest imperfection on a piece of body jewelry can make a huge difference for an initial piercing because when a piercing is healing your body creates fluids in the area to push out bacteria and the like, so when your jewelry doesn't have a proper finish, there is a much greater chance of these fluids sticking to the uneven surface on the jewelry and creating healing issues. More often than not, a nicely polished piece of titanium or surgical stainless steel will heal faster than it’s unpolished or poorly polished counterpart because of this. Hand polishing surgical stainless steel also has the benefit of creating a layer of chromium oxide on the surface of the jewelry, which prevents the nickel in the jewelry from reacting with your body and causing an allergic reaction, this is referred to as “mirror finish”. This isn’t to say there aren’t companies that hand polish externally threaded jewelry, but it is a tad unusual to see a company put the effort into hand polishing their jewelry and not make the change to internal threading. So before getting a new piercing, or even when buying a new piece of jewelry, make sure you ask about the finish on the jewelry and get a look at the threading along with learning what material it is made of. You only want quality pieces in your body, and most piercers will be more than happy to discuss what goes into making their jewelry, some may even be excited.